Washington Square Press, 9781501145186, 384pp. A charming ne’er-do-well returns to his haunted Irish hometown to uncover the truth about his mother in this “supernaturally skilled debut” (Vanity Fair) and turns the town—and his life—upside down. From the moment he arrives, Mahony’s presence completely changes the village. Women fall all over themselves. The real and the fantastic are blurred. Chatty ghosts rise from their graves with secrets to tell, and local preacher Father Quinn will do anything to get rid of the slippery young man who is threatening the moral purity of his parish. A spectacular new addition to the grand Irish storytelling tradition, Himself “is a darkly comic tale of murder, intrigue, haunting and illegitimacy…wickedly funny” (Daily Express). "[A] fast-paced yarn that nimbly soars above the Irish crime fiction genre Kidd clearly knows very well." "Over in Dublin, Jess Kidd’s Himself is her supernaturally skillful debut. Irish eyes are glowing." "For the love of all that’s right and true in the world, you’ve got to read Jess Kidd’s debut Himself (Atria), a fabulously imaginative, darkly comic Irish tale set 'in the arse-end of beyond' in a village called Mulderigg. Reading this picaresque novel is like nursing a pint in a pub while a seanchaí, a traditional storyteller, trills the air with magic and mystery and a local modulates the narrative with irreverent commentary from a stool in the corner...In Mahony, the author has created a literary descendant of Henry Fielding’s “Tom Jones” (also a foundling with parental issues), and in Mulderigg she’s imagined a literary neighborhood akin to Gabriel Garcia Marquez’s Macondo, a place populated with eccentric characters, living and dead. The plot races to an ending of Biblical proportions (as most Irish tales do) and it’ll bring tears to your sorry eyes and joy to your hardened heart." "[A] whimsical mystery… That’s the pleasure of Himself — the way the novel’s plot, with its delicate language and soft Irish lilt, wanders like lush green vines, never seeming to travel in straight lines. A villageful of characters emerge, all of them having a deft way with a line... The mystery here is how the living and the dead live side by side, and the joy is the music with which Kidd brings all of the characters to life." 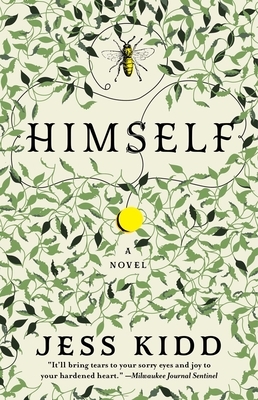 "Himself is Jess Kidd's confident, engaging debut novel. It has a captivating ensemble cast, great jolts of humor and danger, hair-raising plot twists and just enough darkness to make the magic feel true. A thoroughly enjoyable read." "[Full of] glorious characters, worthy successors to those of Dickens and Dylan Thomas...Jess Kidd is an author who shows a poet’s way with words and rhythm in her evocation of Mulderrig...[with] a plot of which Agatha Christie would have been proud...[a] beautifully paced, sometimes funny, sometimes sad and ultimately heart-warming book." "Debut novelist Kidd paints a darkly magical tale of a man who revisits his birthplace of Mulderrig, a small coastal town in Ireland, to investigate the mysterious circumstances of his mother's death 26 years earlier...Joining Mahony on his quest for answers are three women who add even more color to this richly drawn mystery about a town with more than its share of secrets...Told in a unique voice with complex characters, the paranormal mystery will keep readers guessing whodunit until the very end -- all while falling in love with the quirky cast. A darkly comic tale that is skillfully and lyrically told." "I love this book. It’s a magic realist murder mystery set in rural Ireland, in which the dead play as important a part as the living. It’s one of those books that has you smiling as you read, and that you plan to read again very soon." "Jess Kidd is a genius. Her prose sparkles with wit, savagery and startling originality. I loved it." "Diabolical deeds, ferociously kept secrets, black humour and magical realism abound in Jess Kidd’s richly textured, thronging debut...The legions of murmuring, plaintive deceased are what most command our attention in the novel...both noirish crime thriller and rollicking comedy...Kidd has imagination to die for and a real command of plot and character." "An imaginative, witty study of small communities and their secrets." "This striking literary debut is a darkly comic tale of murder, intrigue, haunting and illegitimacy . . . wickedly funny." "Kidd's brilliantly bold debut mixes up murder and mayhem with the eerily supernatural. It's a tender, violent and funny story told in prose that is lyrical, lush and hugely imaginative. Utterly unputdownable." "Page-turning and memorable . . . An exuberant rollercoaster of a read."